Click on ‘Site Backup Pro’. You do not have to signup for their Pro services in order to download a .zip copy of your server files & databases. The Pro services only add additional conveniences, like restoring your websites, etc. Once your .zip files are finished downloading, you’re done! 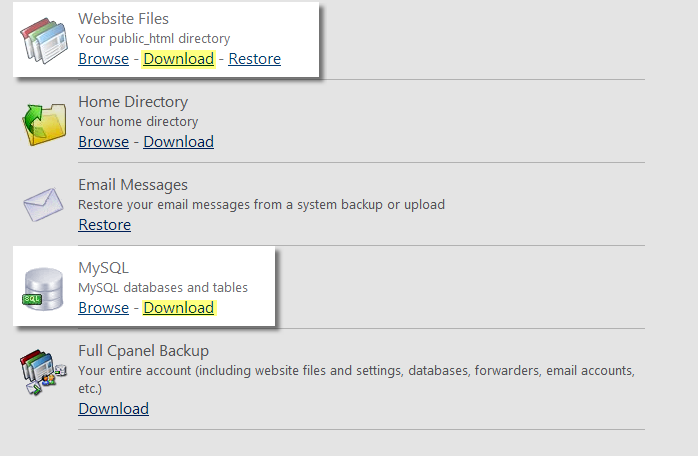 BackupBuddy is a fantastic WordPress plugin to automate full-site backups. However, there are many free alternatives in the WordPress plugin directory that can also get the job done. For example, WordPress Backup to Dropbox. Keeping regular backups offline is ideal for a WordPress website so it can be restored if something did happen. These plugins can backup both WordPress files and your MySQL database. You will need both in order to restore your site if needed. UpdraftPlus - Free with premium upgrades. Backup to Google Drive, Dropbox, Amazon S3, +more.